We wanted to test our own IP address-to-company abilities against the two best-known competitors out there, and perform the first (to our knowledge) public head-to-head performance comparison of reverse IP lookups. This will be Part 1 of a 2-part series. This article will only deal with how well the correct company can be identified from an IP address. Part 2 will delve into the quality of the company data returned. Clearbit and KickFire are the dominant companies in this space, and thus the natural goalposts in any kind of performance comparison. How does BigPicture stack up against these two juggernauts? Read on to find out! IP-to-company is the ability to see which companies are visiting your website, by doing reverse lookups on visitor IP addresses. This ability is not new, but only recently has it started to become more widely used. Bare IP addresses have long been used to identify site visitors, but never revealed much about the identity of a visitor. Then came IP address geolocation, which estimates a visitor's physical location, down to the city, state and country. IP-to-company is the latest iteration in determining who’s behind an IP address, where you can now determine the company for a site visitor. This gets even more powerful when you combine it with website activity tracking, information in your CRM, and automation. We’re already seeing a revolution in how sales and marketing teams operate based on these abilities. At a basic level, all IP-to-Company providers work the same way. First, they all leverage public databases that map IP addresses to large companies, like Google, Amazon, Microsoft, etc. Typically speaking, all providers are good at identifying these large companies, because they can just reference these public databases. However, identifying smaller companies is where the challenge is. Smaller companies that don't have dedicated IP address blocks will just use an ISP, very much like what consumers use to access the internet from home. Every IP-to-company provider thus needs to develop a method to figure out if ISP-owned IP addresses actually represent a small company. Since there is no public map of how ISP-owned addresses map to these small companies (other than the internal customer databases of each ISP), this is where you'll see the biggest performance differences. Because there’s no authoritative reference to compare against for reverse lookups for small companies, accuracy is actually quite hard to measure. Ideally we’d have known contacts at hundreds of small companies visit a control site, and see if Clearbit/KickFire/BigPicture are able to identify the company correctly. Clearly, this would be difficult from a logistics perspective, and very hard to scale. One approach we decided to use comes from fault-tolerant computing systems: since we have 3 providers (Clearbit, KickFire, and BigPicture), we can compare among the 3 and see who agrees. If all 3 providers agree, then we assume that everyone had the right answer. However, if only 2 of the providers agree, we'll assume the 3rd one is wrong. If none of the providers agree, then we ignore that IP address and don’t factor it into the results. As a backup, we also favored IP addresses where we had additional information that could be used to verify the result. Unfortunately, this also biased the results in our favor, and is discussed in the next section under “Test Limitations”. Finally, we did a bit of hand-tuning the results to account for domain variations that are very clearly the same company. For example, “sonypicturesstudiostours.com”, “sony.net”, and “sony.com” all clearly belong to Sony, so any of these would have counted as correct. Ideally, an input data set would be representative of the traffic a customer would see on their site. However, because every customer is so different, there really is no one “ideal” data set that could represent all customers. Furthermore, we were limited in the number of times we could call Clearbit and Kickfire, which limited the sample size we can reasonably test. What we ended up doing was to take a portion of our traffic where we had additional data we could verify the result with, and use that as the comparison inputs for Clearbit and KickFire. We readily admit that this biases the results in our favor, but we did this mainly because we honestly had no idea if any of the inputs would result in at least 2 of 3 providers agreeing, and did not want to end up with a result set where every IP address resulted in an inconclusive result. We point out these limitations because a much larger, completely random test would likely produce numbers that aren’t as favorable to us, and we don’t want to mislead people with unrealistically flattering numbers. Now, before we begin, let’s reiterate that the input data set was biased in our favor, as explained in the previous section. That being said we were pleasantly surprised with the results. Before running the test, it was completely possible that Clearbit and KickFire both came back with the results that agreed with each other, but not with ours, meaning that our results were incorrect. It was also possible that both Clearbit and Kickfire could score better than us on both fill rate and accuracy, meaning there's nothing we can do that they can't also. KickFire almost always returns a result, but many of the results are bad. For about 4% of IP addresses, all 3 providers returned a different result (or no result). We’re not sure which provider was right, so these IPs were removed from the test. For IP addresses where all 3 providers returned a result, about 11% of IP addresses had 2 out of the 3 providers returning the same result, with the 3rd provider disagreeing. In these cases, we ruled the majority answer to be correct and marked the 3rd provider wrong. Clearbit had the lowest fill rate, but very high accuracy. There didn’t seem to be any pattern among the IP addresses where Clearbit returned no result. For many of those IP addresses, both BigPicture and Kickfire returned the same result, so we feel pretty confident in the result we returned. There were a handful of questionable results (about 2-3%) where Clearbit may not have returned a result because it looked like shared-wifi traffic, such as wework.com, and flysfo.com. In these instances, Clearbit is most likely “correct” in not classifying these as corporate traffic, and we should do the same. KickFire had a very high fill rate, but the lowest accuracy. Digging in, it's easy to see why. About 95% of KickFire’s incorrect results are ISPs (e.g. xfinity.com, spectrum.com, etc.). To be fair, Kickfire does recognize that these are ISPs and flagged them as such, but the results are still incorrect because many of those IP addresses were simply smaller companies using an ISP for their internet connection. 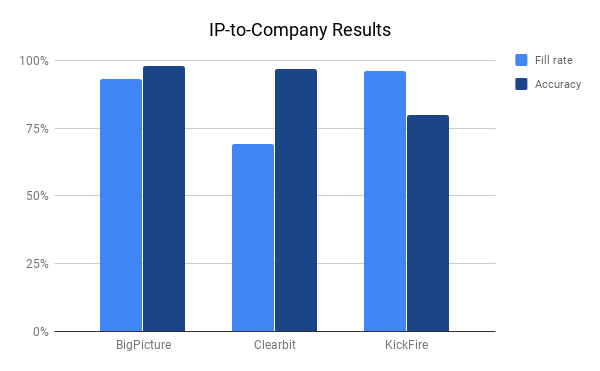 BigPicture and Clearbit were able to recognize the company behind the ISP, which is why we classified KickFire’s result as incorrect. Where does this leave BigPicture? We feel confident in our results, and our ability to compete with Clearbit and KickFire. We would not go so far as to say that we’re better at this point, given the bias in the input sample set, but we don’t believe we’re very far off either. While a broader, unbiased set of input IP addresses would definitely result in a lower fill rate for us, we don’t think our accuracy would be impacted. The lesson here is that neither Clearbit nor Kickfire are infallible either, and that we all have room for improvement. What does your traffic look like? Are you a Clearbit or KickFire user? We’d love to go head-to-head on your traffic to give you a comparison meaningful for you. Even if you’re not a current user of IP-to-company, we’d love to start revealing who’s behind your website traffic and win your business. Contact us for a free trial, and let’s start demystifying your website traffic today!